"This was one of those projects that I decided to do on a whim one day, and 30 minutes later, it was done." 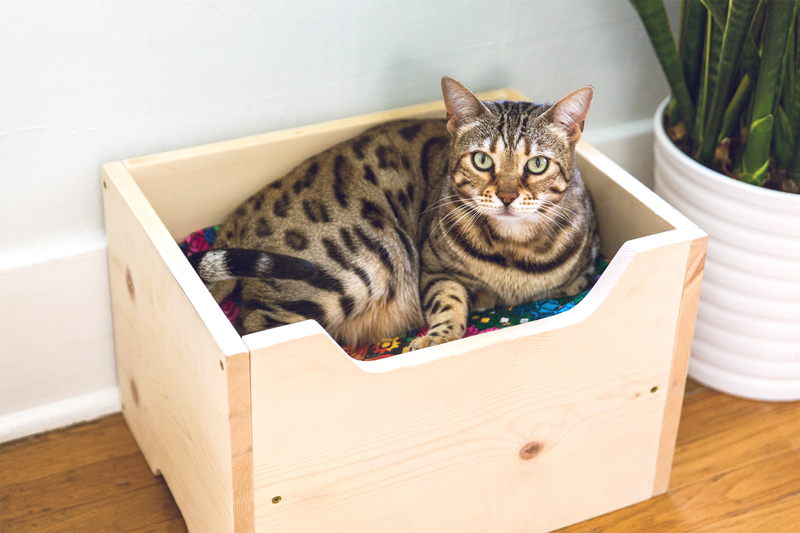 Looking for more great pet-themed DIY projects? Check out our tutorials for a cat taco costume and pet bowl stand. When I was 11, I got Kitty. We attempted to give her a real name, but nothing stuck, so for 13 years, she’s just been Kitty. I was the one who picked her out of the litter, and she won a special place in my dad’s heart. But now with all of the kids grown and out of the house, she’s not getting quite as much attention as she once did. To make up for that, I designed this cat bed for Kitty so she could hang out with me in my workshop at my parents’ home (when I’m not sawing or making loud noises, that is). I built it especially so she could look out the window (surveying her kingdom is very important to her). This bed is a cat bed because I have a cat, but it can double as a bed for small dogs, too! 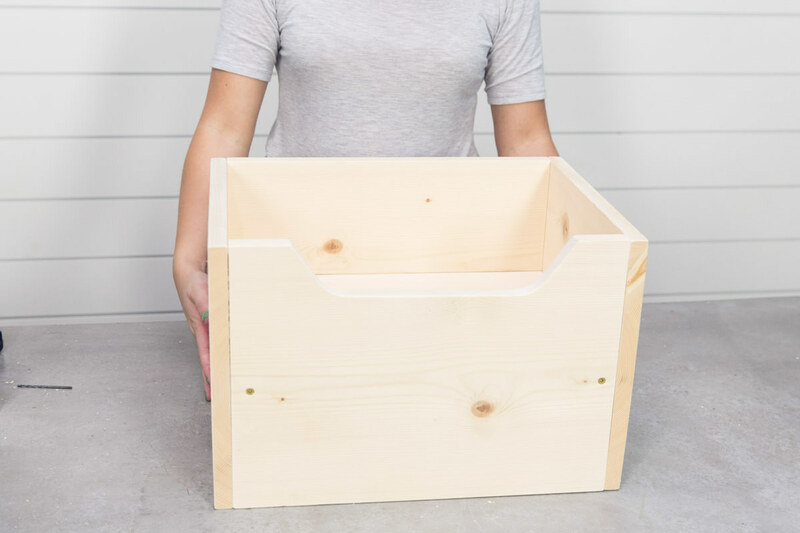 I love this project because it's super easy and quick, and you can easily adjust it to your skill level. I added some details with a jigsaw, but if you don't have one you can skip the detail work and still make yourself a bed for your pet! This cat bed is made from a one-by-twelve. You’ll notice that the bottom of it is elevated, so you’re only using the top half of the one-by-twelve. I went with a board I had lying around—it happened to be spruce, but you can make this out of whatever. For your cuts, cut three pieces to 15 1/2". Cut two more pieces to 12 3/4" long. 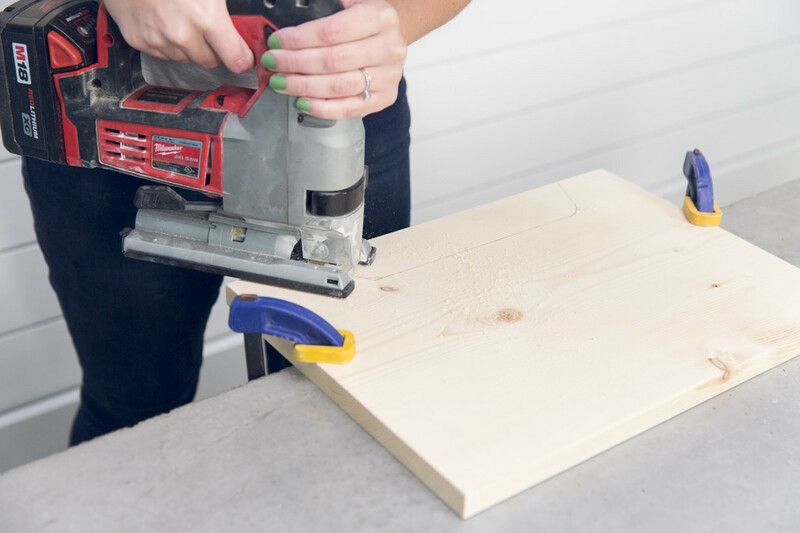 You can use a handsaw, a circular saw, or a sliding chop saw. 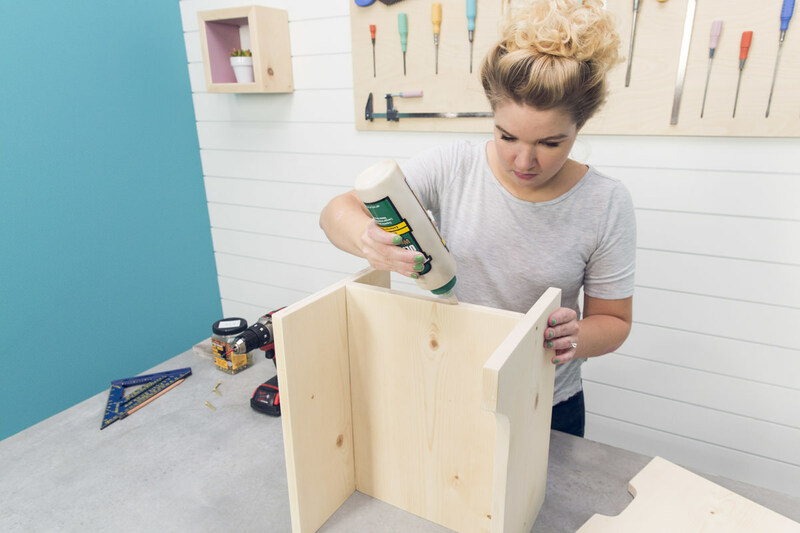 At the end of this step, you’ll have a front piece, a back piece, two side pieces, and a base. We’re starting with the front of the bed. The front side has a cutout that makes it easier for pets to get in and out, plus it’s aesthetically pleasing. 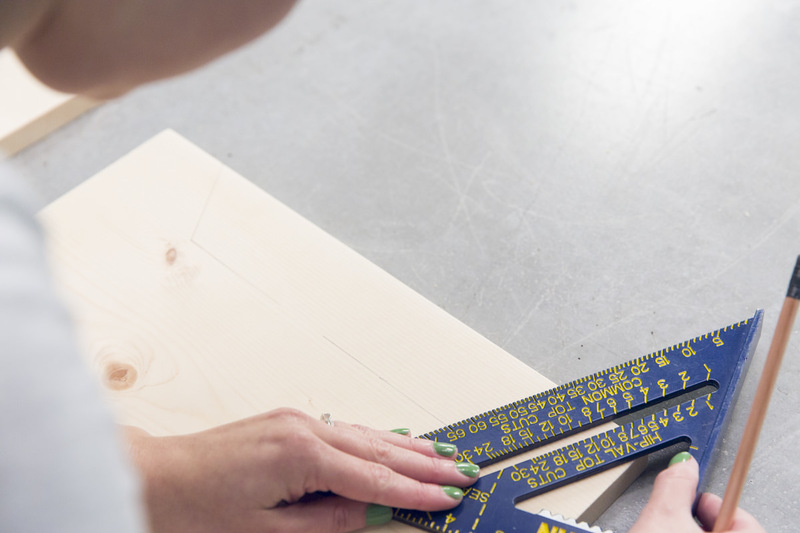 Grab the front piece, then use a speed square or ruler to measure the cutout. Along the top of the board, measure and mark 2 1/4" in from either end. From these two points, measure down from the top 2 1/4" and mark. From these two points, measure in 1 1/2" and mark. Draw lines to connect all of these marks, and pencil in a freehand curve at the corners. Next, we’re going to do the same thing we did on the front with the side pieces. These will serve as little handles on the bottom of the cat bed to make transporting it easier. Measure along the bottom of the board 4 1/4" from either end. Mark with a pencil. From these points, measure up 1” and mark. From those points, measure in 1/2" and mark. 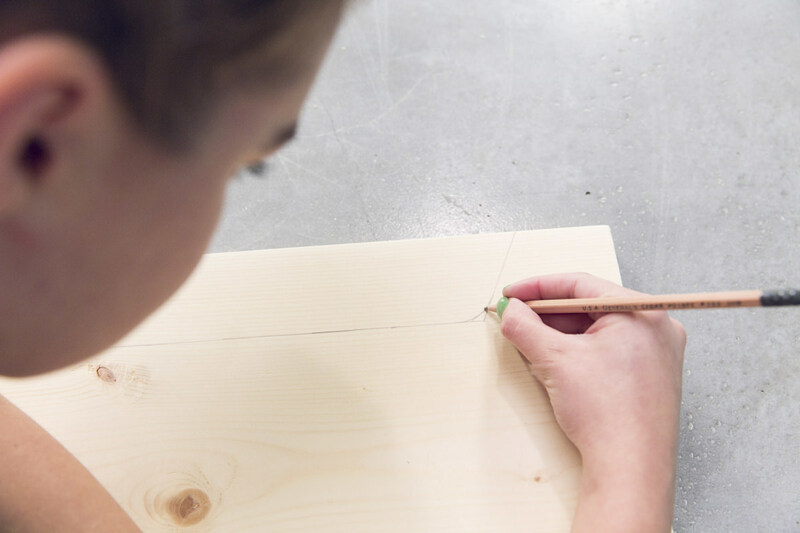 Draw lines to connect all the marks, and draw a freehand curve in the corners. 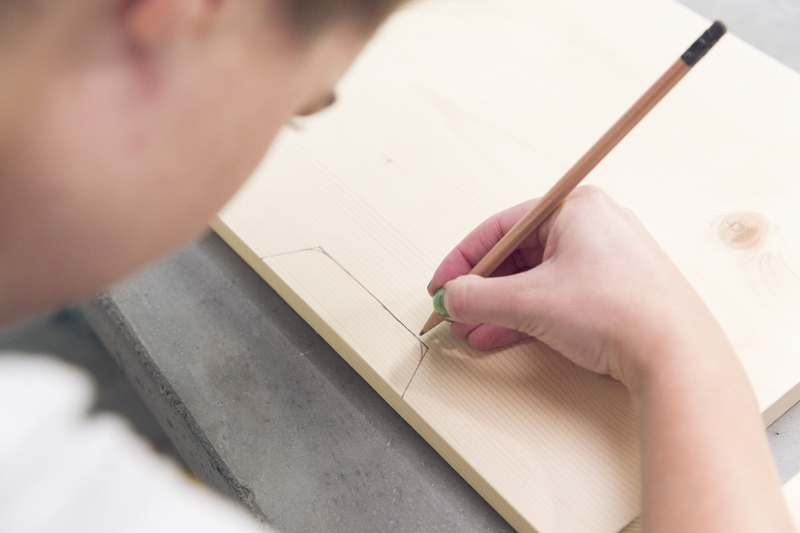 Clamp down your wood pieces on a stable surface, then follow the lines with a jigsaw. Using tape (like we did in our “How to Make a Mountain Range Coat Hook” blog) could make this step easier. I went for something quick and easy, so I didn’t use tape—but if you want to, good for you! A note about jigsaws: Be careful when you come to a curve. 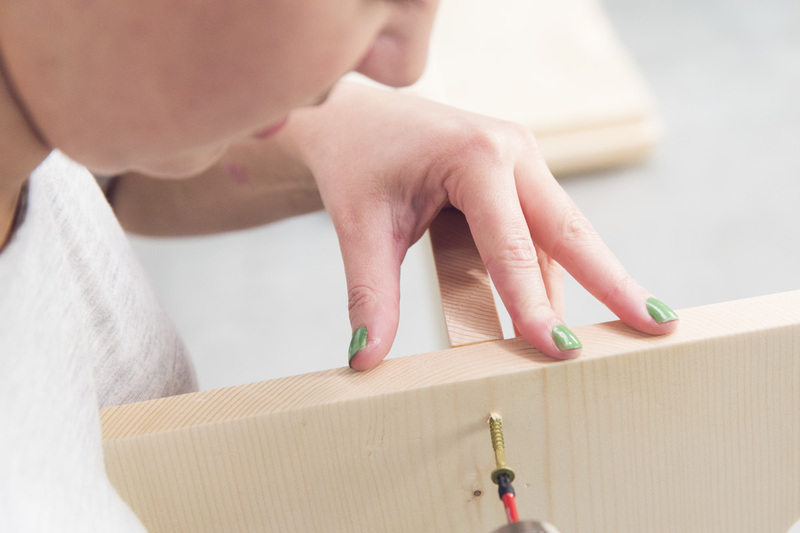 If you turn too quickly, the saw blade can bind up—and disaster ensues. Pay attention to the feel of the saw: when you're pushing the turn too hard, you'll be able to feel it. 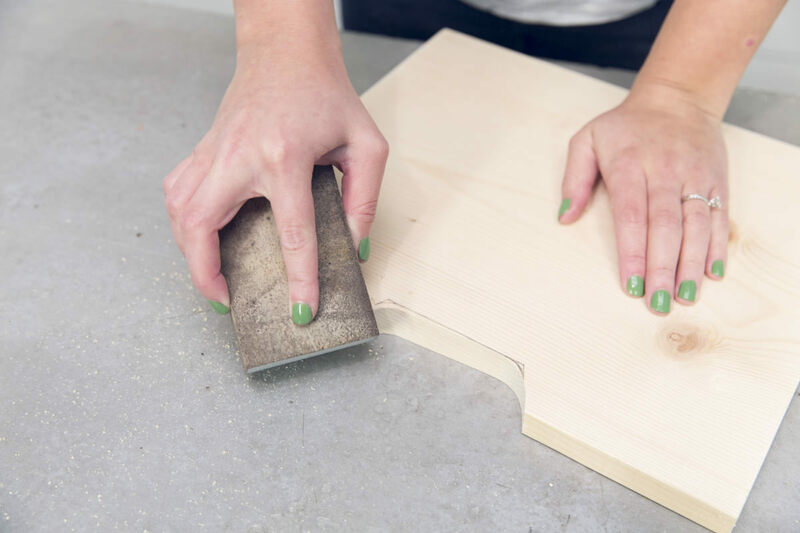 Use a sanding sponge to smooth out the cut edges and any rough spots on the boards. Next, measure and mark 5 1/2" up from the bottom of both the front and back pieces, and draw a line horizontally across each one—this is where the base piece will sit. The base piece will be elevated so your pet can see out. First, attach the base to the front piece by placing both pieces on their ends and positioning them perpendicular to each other. (The base should be lined up at the location of your pencil line.) 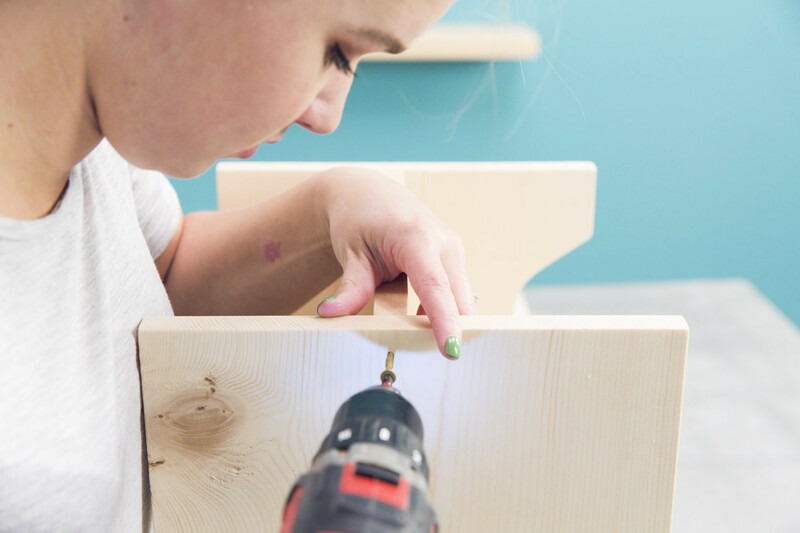 Glue, then secure with a 1 1/2" screw on either end. Next, attach the back piece on the other side of the base. Secure with glue and a screw on either end. This step is really simple. 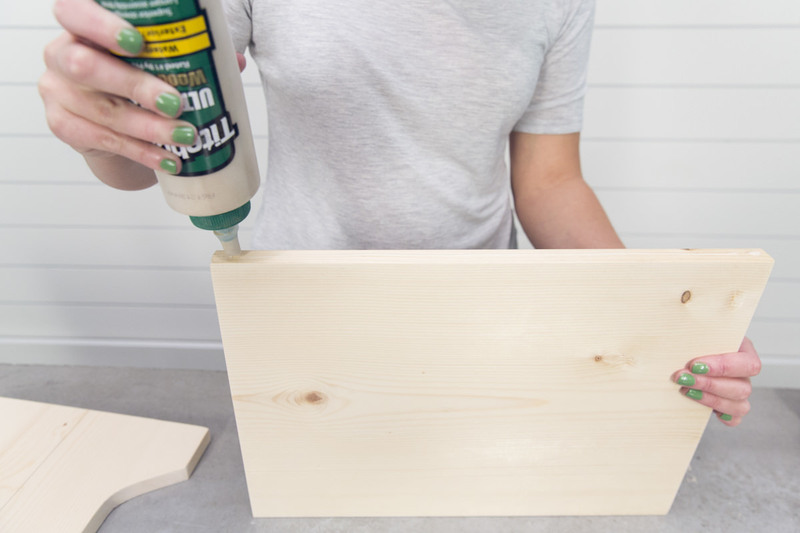 With the bed on-end, apply glue to all of the edges and attach one side with the handle part down. Pre-drill holes in the four corners, then secure with 1 1/2" screws. Once that side is completed, flip it over and repeat these steps on the other side. This was one of those projects that I decided to do on a whim one day, and 30 minutes later, it was done. I kept mine raw, but you could paint yours, stain it, give it some kind of finish—whatever works. 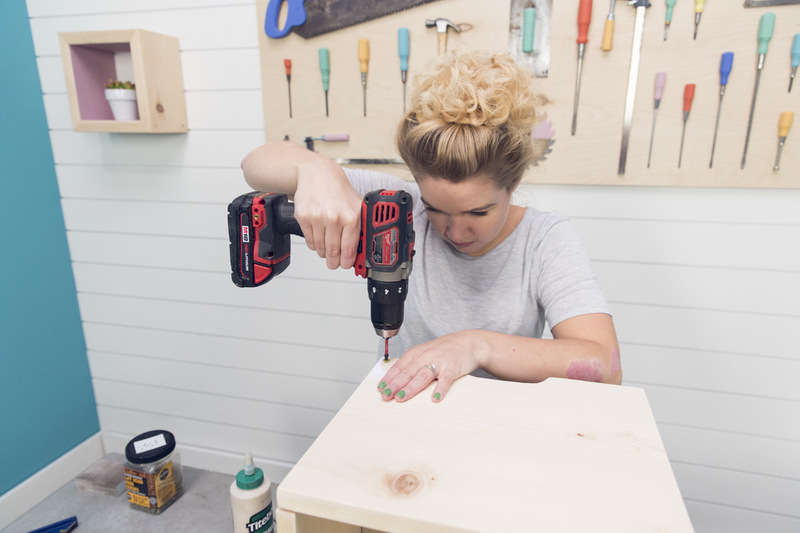 Throw in a little pillow or blanket in your new DIY cat bed, and you’ve got a throne worthy of your pet. Painting your front door is a great way to instantly increase your home's curb appeal. 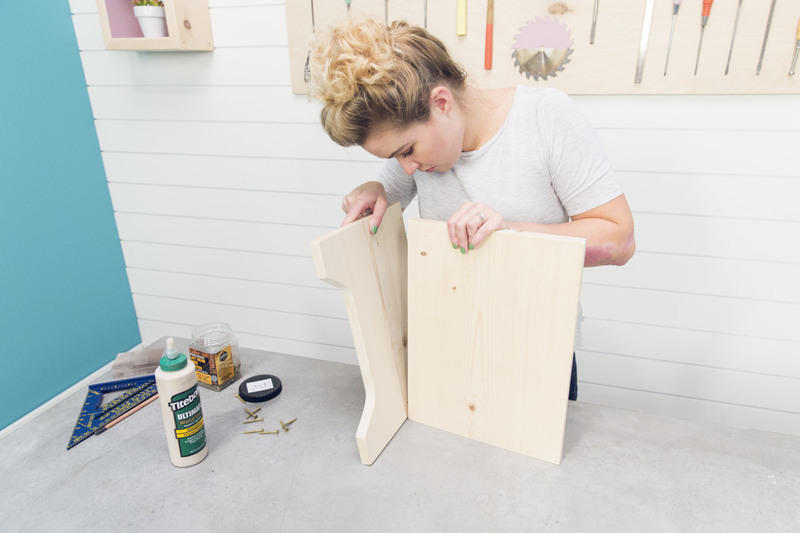 We partnered with Daly's Paint and Decorating Wood Finishes, a Seattle-based, family owned paint company, to bring you a step-by-step guide to upping the wow factor of your home's first impression.